The Auld Post Hotel and the Thunder Road American Diner, Kitty’s now provides a stylish venue with the latest in entertainment technology, including Community and Audica sound systems installed by Livingston-based Images. Barry Devine, General Manager of Images, headed up the design and installation team. 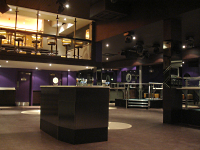 The main system is based around Community’s iBOX Series, chosen by Devine who had first hand experience of its impressive capability having previously installed it at Club Earth in Livingston. The main dance floor mid/high system comprises six Community iBOX iHP1294, driven by three QSC RMX4050 amplifiers. One Community SBS45 and two Community TLF 218s, driven by two QSC RMX5050 amplifiers, supply powerful bass reinforcement and a further six Community full-range STS26 systems driven by QSC RMX1850 amplifiers provide the main room in-fill. An XTA DP6i handles processing and control and the DJ booth houses a Formula Sound FSM600 mixer and twin Pioneer CDJ1000 digital decks. A striking glass-walled VIP room overlooks the main room and dance floor. 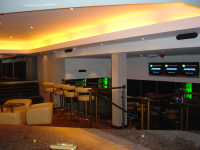 With the design and atmosphere of a stylish lounge bar, Devine proposed and installed an Audica system. 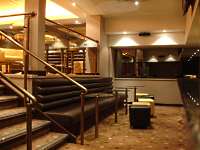 Again this choice was based on experience, having installed Audica in Rodeo’s restaurant in Hamilton. To provide moderately high levels the system uses six Audica MICROline loudspeakers. Signal processing for the MICROlines is provided by an Audica MICROzone controller, which feeds a KIND MCX126 6-channel power amplifier. Bass extension is provided by two 8-inch 100W Audica MICROsub active systems. Many other features of Kitty’s show the latest technology, including an innovative and impressive spirits dispensing system to speed up serving times at the bars, moving head smoke machines, lasers and Griven lighting tiles on dance platforms. One feature, however, also has interesting links to Kircaldy’s past. The main dance floor is made from the latest high-tech linoleum, inlaid with the club’s logo; a link back to when Kirkcaldy was the world’s largest producer of linoleum.